Appointed as Coordinator of the Amarillo College Suzuki Program in 2000, Camille Day Nies teaches private viola students aged 3 to 17 along with group viola classes, ensembles, and parent courses. As faculty of the Amarillo College Music Department, she teaches online Music Appreciation courses and teaches applied music in strings and voice. Mrs. Nies has been a member of the Amarillo Symphony viola section since she was 15, serves as principal violist in the Amarillo Opera orchestra, and enjoys performing with Chamber Music Amarillo. She founded and performs with the Crystal String quartet, and has played with the Rockford (IL) Symphony, Philharmonia New Mexico and the Symphony of the Southwest, as well as many other regional and community ensembles. 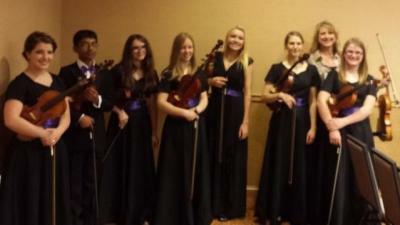 Mrs. Nies’ public education experience includes teaching orchestra and choir in Amarillo area schools. Also a vocalist, Mrs. Nies has appeared with the Amarillo Opera in many roles and was twice featured as Prince Orlofski in Die Fledermaus. She has performed as soprano soloist in the Mozart Requiem and Haydn Lord Nelson Mass and has been featured as a vocal soloist with the Amarillo Symphony. She is an alumnae of the outdoor music drama TEXAS. A true product of the synergy between education and the arts in the Texas Panhandle, Mrs. Nies studied with Harrington Quartet violists Amy Brandfonbrener, Ted Allred, and Joanna Mendoza, and received her Bachelor of Music Business degree and Master of Vocal Performance degree from West Texas A&M University in Canyon. Her pedagogical training includes study with Elizabeth Stuen-Walker, Beverly de la Bretonne, William Preucil, Doris Preucil, Joanne Bath, Stevie Sandven, and Marilyn O'Boyle. She and her husband, Andy, Assistant Superintendent of River Road ISD, run frantically after their two children, Mackenzie, a Suzuki violinist, and William, a Suzuki cellist. The SAA considers training to be professional pedagogical study, intended for well-trained musicians. A video audition is required and must be accepted for participation in an SAA-approved Teacher Training.